NATURAL HABITAT AND PREFERRED SITE: This hybrid is adapted to a fairly wide range of soils with the exception of solid white rock in poorly drained soils. It can grow in full sun to fairly heavy shade. IDENTIFICATION INFORMATION: An upright evergreen holly with smooth edged leaves and red berries in the fall and winter. It is normally a single-trunked and stately tree. 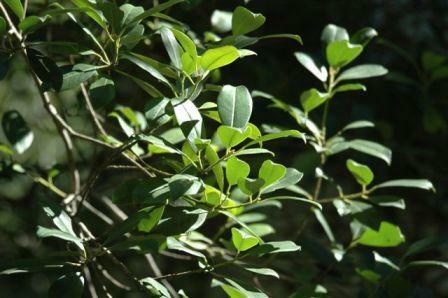 Large bush or small tree with upright moderate growth, open branching and smooth, light bark. FLOWERS AND FRUIT: Flowers are small white flowers in the spring that attract bees and other pollinators. Fruit is red berries in the fall and winter, quite showy. BARK: Very smooth – light to medium gray, darkening with age. FOLIAGE: Smooth edged, oval leaves that tend to be slightly cupped downward. Single spine on end of leaves. CULTURE: Grows well in most soils except highly rocky alkaline or poorly drained soils. Needs moderate water and fertilization and excellent drainage. PROBLEMS: East palatka holly when in stress can be attacked by scale insects, mealybugs and other pests. It develops iron deficiency in white rock or if fertilized heavily with synthetic fertilizers. This problem can be overcome with the Sick Tree Treatment and the Basic Organic Program. PROPAGATION: East palatka can be grown from seed collected mature in the fall and early winter but who knows what the resulting in plant will be since this is a hybrid tree. INSIGHT: One of the prettiest holly trees, distinguished by one spine on the end of the leaf rather than several as with Savannah and Foster hollies. These are hybrids of Ilex opaca – the American holly.